Tabitha Serannon can perform miracles of healing, yet people are dying in her hands. A prophecy points a crooked finger beyond Eyri and Tabitha must abandon her followers to rescue the source of her power. Every step takes her farther into the terrors of Oldenworld, but she must liberate the essence of life before it is corrupted by chaos. This is no game: a traitor lurks among the wizards, a ruthless enemy hunts her with whips of wildfire and she could lose her closest friends with one wrong move. On the journey to mastery, whom can she trust? She has only her faith in love and her fading song to guide her. Greg Hamerton is a novelist and extreme sports writer. Beyond The Invisible explored themes of fear, freedom and flight. He wrote a guidebook for paragliding in South Africa. He is an active paraglider pilot and outdoor enthusiast. 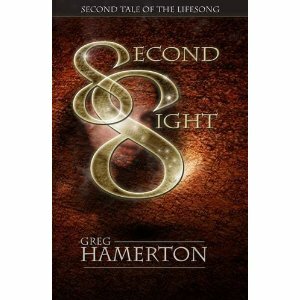 Second Sight is the second tale in his Lifesong series. I hadn’t read Greg’s first book of this series The Riddler’s Gift so I decided to read this first. These books aren’t normally something I would read, a little meatier going than my normal preference but I really enjoyed them. I will defetly read the next book in this series. I don’t think it has made me want to read more sci fi but more Greg Hamerton. Second Sight carries on from the battle in The Riddler’s Gift starting in a place called Eryi, which is trying to rebuild itself after the battle. Tabitha Serannon, is trying to heal the injured with her gift. Chaos is building in the Oldenworld, where Tabitha is dragged into. Can she save herself? Greg has a talent to bring his characters to life and his writing is beautiful. Although this book is part of a series, it can be read as stand alone although I am glad I read the first installment. If you like heavy fantasy like Lord of the Rings you will love this book, and if you haven’t read much in this genre I would recommend you give it a go. I was lucky enough to win this book from Goodreads. The author Greg Hamerton put a fantastic personalised inscription, thank you. Love the cover – nice review! I'm so jealous!I read the first book 🙂 have to get my hands on this one!